Carrot Cake never goes out of style and one bite will tell you why. This rich and moist spice cake, full of grated carrot and toasted nuts, has great flavor, especially when covered with a tangy and sweet cream cheese frosting. 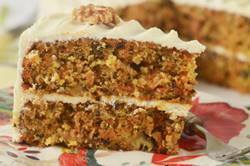 The interesting part is that while those pretty orange flecks of grated carrot give the Carrot Cake color and texture, along with sweetness and moisture, its' flavor is almost indistinguishable. I think the biggest debate surrounding the Carrot Cake is whether crushed pineapple or applesauce should be added to the batter. Adding either of these ingredients will give the cake added flavor and moisture so, if you like, add 1/2 cup (120 ml) of either crushed pineapple or applesauce to the batter, right along with the oil and vanilla extract. Take note, though, that you may need to bake the carrot cake a few minutes longer than the recipe states. Although using carrots in baking may seem odd, Alan Davidson in 'The Oxford Companion to Food' tells us that carrots were used in European sweet cakes since the Middle Ages when other sweeteners were hard to find or just too expensive. In fact, carrots, along with beets, contain more sugar than most other vegetables which might explain their use in desserts. Speaking of carrots, the orange carrots we enjoy today originated from the purple variety grown in Afghanistan since the 7th Century AD. As carrots moved westward into Europe the orange variety came about and this is the variety the English settlers brought to America. 'Carrot' comes from the Greek word "karōton" and the Greeks started the belief that eating carrots would improve your eyesight. John Ayto in "An A-Z of Food & Drink" tells how during World War II the British furthered this belief by saying that British pilots improved their night vision by eating huge amounts of carrots. They were, however, only trying to encourage the eating of carrots as it was one of the few foods that were not in short supply during the war. If you would like to make marzipan carrots to decorate the top of the cake, you will need marzipan and orange and green icing colors (can use liquid or paste food coloring). Knead a small amount of orange food coloring into the marzipan until the color is distributed and is the desired "carrot" color. Shape into carrots, using a toothpick to make veins. Knead a small amount of green food coloring into the marzipan and make the carrot tops. Marzipan is a cooked mixture of finely ground almonds, sugar, and water. It is slightly sweeter and firmer than almond paste and has a smoother texture. It comes in plastic-wrapped rolls. Also, for a more casual dessert you could bake this cake in a 9 x 13 x 2 inch (23 x 33 x 5 cm) pan. Just increase the baking time to between 30 to 40 minutes. Carrot Cake: Preheat oven to 350 degrees F (180 degrees C) and place rack in center of oven. Butter or spray two - 9 x 2 inch (23 x 5 cm) cake pans and line the bottoms of the pans with a circle of parchment paper.